After three days in Madrid, we took the AVE train to Sevilla, very fast, very comfortable but oddly not very accessible, especially for older travels with heavy suitcases. Younger travellers were very kind and helpful, which the train staff were not. City centre to city centre is very convenient though. Sevilla is a beautiful city, with lovely plazas and a magnificent walk along the Guadalquivir River. We stayed in the barrio Santa Cruz and I was disappointed in our hotel-Petit Palace de Sant Cruz- and uncomfortable in the area. Unless you are a fan of narrow and closed-up streets –no windows, shuttered shops, and what seemed to be unfriendly faces, choose another section of the city. We loved our stay in Venice a couple of years ago and I thought this would be similar, but it wasn’t. 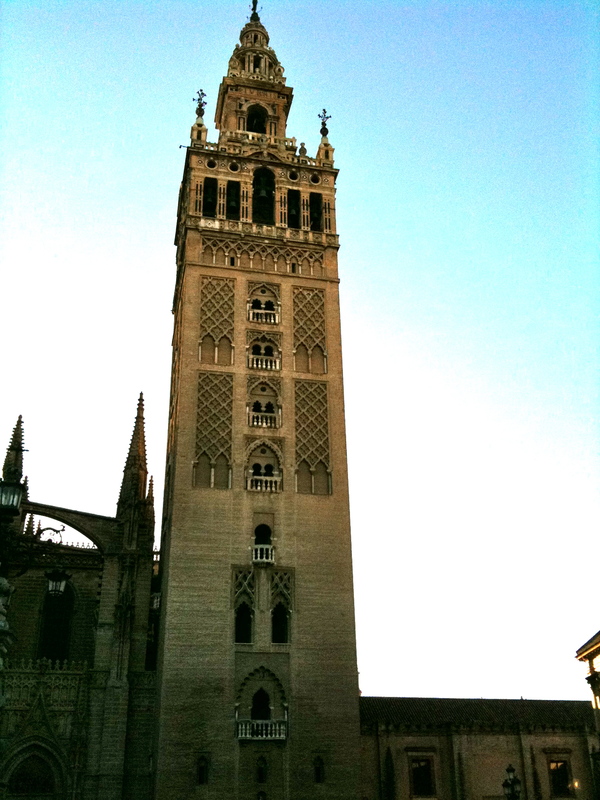 The Cathedral in enormous, but the most beautiful feature was the Giralda-the bell-tower converted from a minaret– that stands beside it. The gardens of the Alcazar, and the lovely tile work within it, the parks and the paseo along the river, the narrow Calle del Agua and the restaurant Corral del Agua–all memorable. After three days we were off on the bus to Ronda.